While other products may use chlorine which can irritate skin, or smelly perfumes to try to eliminate odors, LockerShocker goes right down to the molecular level to destroy the molecules that are causing the stink. By creating an invisible shield Locker Shocker constantly fights bacteria and controls odors 24/7. The active ingredient in LockerShocker forms a colorless, odorless, positively charged polymer, which chemically bonds to the treated surface. You could think of it as a layer of electrically charged swords. When a microorganism comes in contact with the treated surface, the molecular “sword” punctures the cell membrane and the electrical charge shocks the cell. Since nothing is transferred to the now dead cell, the sword doesn’t lose strength and is ready for the next cell to contact it. LockerShocker doesn’t use chlorine or related compounds like other brands do. Therefore LockerShocker won’t bleach or stain. 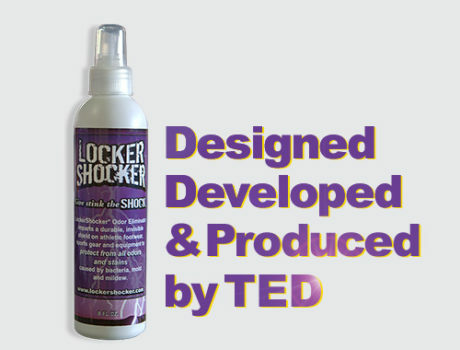 LockerShocker creates an invisible shield that literally breaks apart the offending odor molecules. The active ingredient in LockerShocker is used worldwide in athletic facilities and anywhere bacteria, mold and mildew are a constant problem. In a nutshell, LockerShocker is: Skin contact safe; bonds itself to the surface and doesn’t leach out onto socks or skin; lasts up to 30 days between treatments; provides long term protection against bacteria regrowth; is effective long term on a wide variety of equipment such as helmets, pads, gloves, protective gear, exercise mats; exact formula used by professional sports teams in treating training facilities; wins the odor elimination test.